I also think it was an attempt to try some healthier dishes, because on top of eating fish we agreed that nothing would be breaded or fried. We both enjoying cooking and trying new recipes, so this should be fun. I also thought it would be fun to share our fish-week adventure with you. So, I will take a picture of each meal we eat and share the recipes and the family’s opinion of the meal. The recipe name will be the link unless other directions follow. Family’s Opinion: It was a hit!! The kids loved the salmon and decided the asparagus wasn’t too bad either. Husband and I loved it all. My plate (pictured) held 3 1/2 oz. 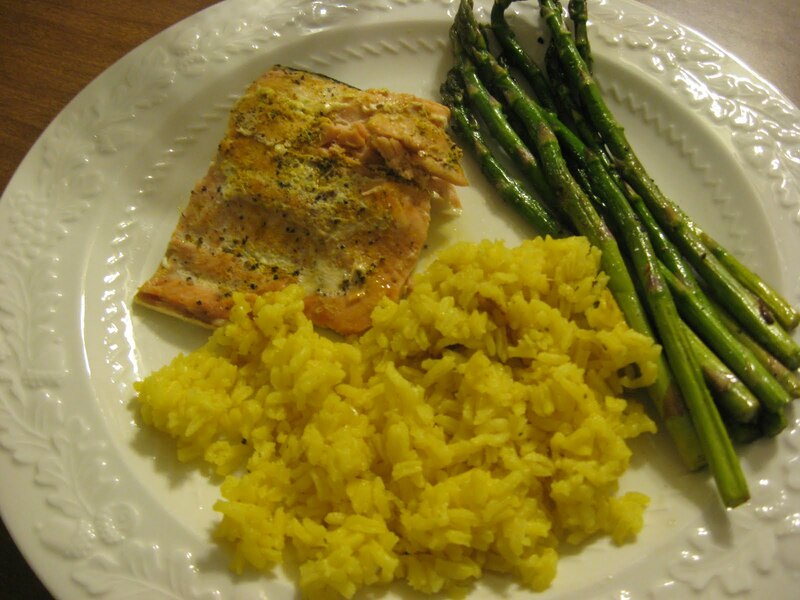 of salmon, 1/2 c. yellow rice and 2 oz. asparagus for a total of approximately 250-275 calories. Heat skillet and spray with Olive Oil Pam Spray. Toss in rinsed asparagus. Sprinkle with kosher salt and ground pepper. Sautee a few minutes and then turn over. Asparagus done when tested with a fork and found to be crisp tender. I do this in small batches so that they are in a single layer cooking evenly in the skillet. I’m excited to try our other new recipes. There will be mexican flavors, some grilling and a few other things. How about you? Do you ever branch out and try new recipes? If so, what new things have you tried in the kitchen since you’ve been on your weight loss journey? I think it's a great idea. I have been moving into more fish myself, just recently tried cod and scallops and like both. I've been wanting to add more fish recipes to our meals, too. It's scary to try because it seems that fish isn't very forgiving; if you mess up, it's bad and no one wants to eat it. BUT that could just be my cooking! LOL I want to get better at it. I love that you included your kids' opinions. That's what I did for my veggie blog. I wanted to learn how to cook veggies…Sorry if I'm redundant — I'm trying to remember if you've already seen the blog. Anyways, I try veggies and report how the family likes it. Thanks for the fish recipe — it's good to have tried and true recipes.